This column is the seventh in our series pro- filing senior AI researchers. 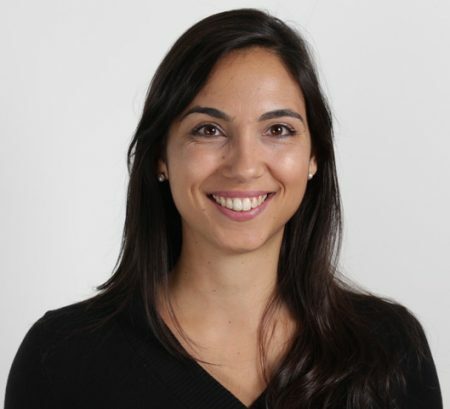 This month we are happy to interview Iolanda Leite, Assistant Professor at the School of Computer Science and Electrical Engineering at the KTH Royal Institute of Technology in Sweden. This is a great opportunity to get to know Iolanda, the new AI Matters co-editor in chief. Welcome on board! Iolanda Leite is an Assistant Professor at the School of Computer Science and Electri- cal Engineering at the KTH Royal Institute of Technology in Sweden. She holds a PhD in Information Systems and Computer Engineer- ing from IST, University of Lisbon. Prior to join- ing KTH, she was a Research Assistant at the Intelligent Agents and Synthetic Characters Group at INESC-ID Lisbon, a Postdoctoral As- sociate at the Yale Social Robotics Lab and an Associate Research Scientist at Disney Re- search Pittsburgh. Iolanda’s research inter- ests are in the areas of Human-Robot Inter- action and Artificial Intelligence. She aims to develop autonomous socially intelligent robots that can assist people over long periods of time. When and how did you become interested in CS and AI? I became interested in CS at the age of 4 when the first computer arrived at our home. It is more difficult to establish a time to define my interest in AI. I was born in the 80s and have always been fascinated by toys that had some level of “intelligence” or “life-likeness” like the Tamagotchi or the Furby robots. During my Master’s degree, I chose the Intelligent Sys- tems specialization. That time was probably when I seriously considered a research career in this area. Seeing my students accomplish great things on their own. I always loved to work with children so maybe something related to child education. As an early researcher I often had a hard time dealing with the rejection of papers, applica- tions, etc. What I wish the “past me” could know is that if one keeps working hard, things will eventually work out well in the end. In other words, keeping faith in the system. All of them! If I have to highlight one, we are working with elementary schools that have classes of newly arrived children in a project where we are using social robots to promote inclusion between newly arrived and local chil- dren. This is part of an early career fellowship awarded by the Jacobs Foundation. I believe that AI can be used to complement teachers and provide personalized instruction to students of all ages and in a variety of top- ics. Robotic tutors can play an important role in education because the mere physical pres- ence of a robot has shown to have a positive impact on how much information students can recall, for example when compared to a virtual agent displayed in a computer screen deliver- ing the exact same content. How can we make AI more diverse? Do you have a concrete idea on what we as (PhD) students, researchers, and educators in AI can do to increase diversity our field? Something we can all do is to participate in outreach initiatives targeting groups underrep- resented in AI to show them that there is space for them in the community. If we start bottom-up, in the long-term I am positive that our community will be more diverse at all lev- els and the bias in opportunities, recruiting, etc. will go away. Leaving my home country (Portugal) after fin- ishing my PhD to continue my research career because I miss my family and friends, and also the good weather! If AI could fully address any of the Sustainable Development Goals established by the United Nations, it would be (more than) great. Al- though there are excellent research and fund- ing initiatives in that direction, we are still not there yet. One of my favorite ones recently was the Westworld TV Series because of the power relationships between the human and the robotic characters. I find it hard to believe that humans will treat robots the way they are treated in the series, but it makes me reflect on how our future interactions with technol- ogy that is becoming more personalized and “human-like” might look like.